Argentina has experienced continuing economic upheaval. This region is an isolated backwater, thousands of miles from the main centres of Spanish rule. This region of South America has assumed much greater importance than before. 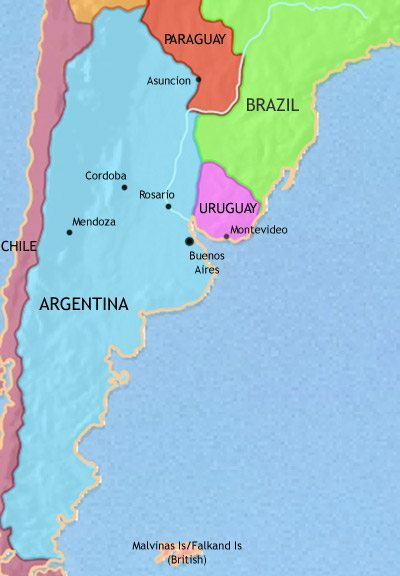 Since independence, Paraguay and Uruguay have split away from Argentina. Paraguay has been utterly ruined by a war with its neighbours. Argentina has attracted European investment on a large scale. The charismatic figure of Eva Peron has added colour to Argentine politics. The military dictatorships are unable to solve Argentina’s economic problems. Finally, in 1973, Peron’s supporters win power and he returns to the country as President. He dies the following year, to be succeeded in power by his third wife, Isabel. She, however, is in turn unable to deal with the hyper-inflation, and is ousted by the armed forces in 1976. The new military regime kills or imprisons thousands of its opponents, especially its left-wing critics, and then blunders into a humiliating war with Britain over the Malvinas (or Falkland) Islands (1982). This defeat leads to the return of civilian government the following year. However, successive civilian governments have been unable to cure Argentina’s economic ills, leading to a virtual meltdown of the economy in December 2001. Nevertheless, there was no return to military rule, and since 2002 the country has seen a steady economic recovery. Until recently a stable and prosperous country, Uruguay suffers from economic crisis as its agricultural exports fall in price. This triggers social and political conflict, including guerilla activity, and in 1973 the army steps in to take control of the government. Democracy is restored eleven years later (1984). Since then the country has known cycles of economic growth and decline, but has remained politically stable and wedded to democracy. Paraguay was ruled by the dictator Alfredo Stroessner, who presided over a period of economic progress until he was toppled in a bloody military coup in 1989. The country became a democracy in 1993 – for the first time in its history. Since then the country has experienced periods of economic expansion and decline, tied largely to fluctuations in the price of its commodity exports. 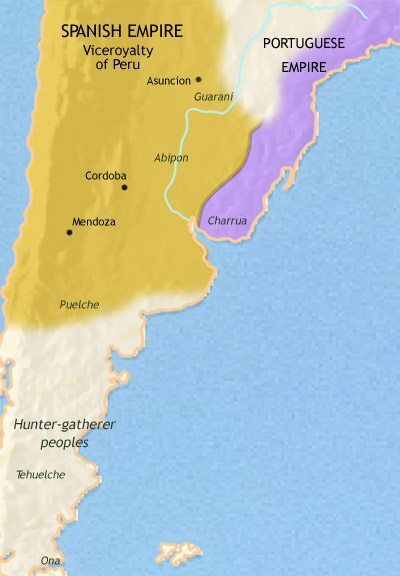 The predominant indigenous people of what is today northern Argentina, Paraguay and Uruguay were the Guarani, who had migrated into the area some centuries before from the Amazon region. They were farmers living in settled villages. Further south, small, mobile groups of hunter-gatherers roamed the grasslands. 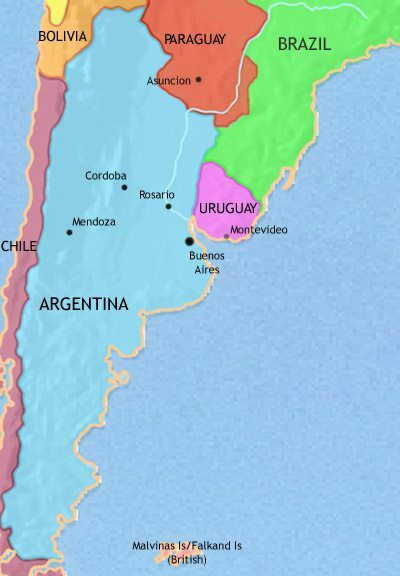 The Spanish first attempted to establish a settlement on the south-eastern coasts of Spanish South America in the middle 16th century, at Buenos Aires. Indian attacks forced its abandonment, and the first permanent Spanish settlements were in the fertile land of present-day Paraguay, 1,000 miles inland from the Atlantic coast. The colonists soon started inter-marrying with the indigenous population, there being few European women amongst them. This region saw the rise of a remarkable kind of community. Members of the Catholic Jesuit Order in Paraguay and southern Brazil gathered Guarani Indians together into settlements organized virtually along monastic lines. Sadly, these communities became prized targets for “Bandeirantes”, slave raiders from the Brazilian coast. 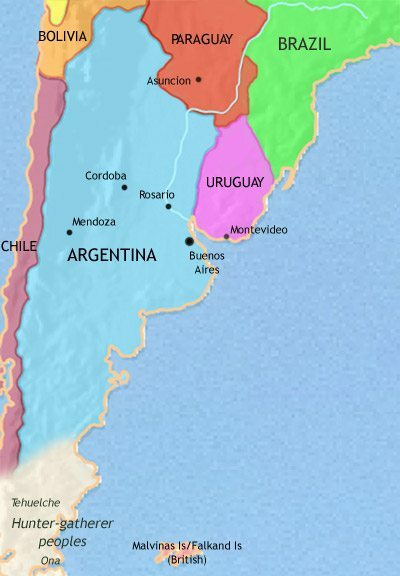 Buenos Aires was re-founded in 1580; but the east coast remained an isolated backwater, thousands of miles from the main centres of Spanish rule. The south-east region of South America has assumed much greater importance in the late 18th century. Direct trade with Spain is now permitted, and with the rise of transatlantic trade the fortunes of Buenos Aires and surrounding areas have greatly improved. The city itself is growing dramatically, and has been raised to equal status with Lima and Mexico City as one of the capitals of Spanish America. Herds of wild horses, whose descendants arrived with the Spaniards two hundred years before, now roam the Pampas of Argentina. These are being rounded up, tamed and used for transport purposes. As a result of this activity there is growing up a class of South American “cowboys” called gauchos – complete with formidable Indian foes, now also riding on horseback. At this date the southern parts of Argentina, Patagonia, remain almost entirely untouched by Spanish rule. The Jesuit communities of Paraguay and southern Brazil have now vanished. The Jesuits had aroused the jealousy of the local landowners (who coveted the Indian labour the Jesuits controlled) as well as the Spanish government (who had an eye on the great wealth the order had accumulated). In 1767 the Jesuit order was banished from all Spanish lands. Their communities were handed over to officials, who, either through incompetence or corruption, allowed them to wither away. Their Indian labourers soon found themselves working as serfs on the large landed estates of the region. Buenos Aires was attacked by British forces during the Napoleonic Wars, in 1806-7. Spain’s inability to defend the city threw the inhabitants on their own resources, and they succeeded in repulsing the attack. The self-confidence that this gave them – and the fact that Spain itself was conquered by French forces – encouraged the leadership in Buenos Aires to declare self-governance in 1810. This was upgraded to a full declaration of independence in 1816, commencing the Wars of Independence. 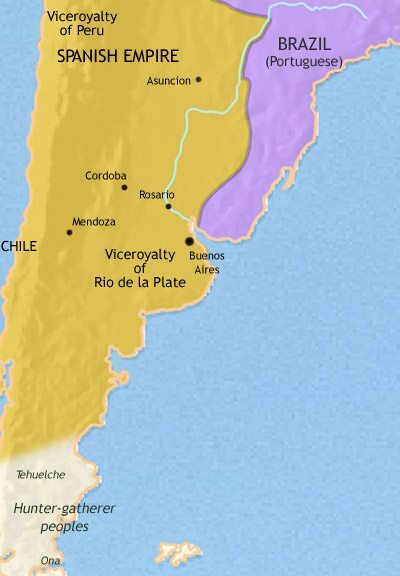 The initial aim in Buenos Aires had been that the whole of the Rio de la Plata viceroyalty would become a single independent nation, but the outlying portions – Bolivia, Paraguay and Uruguay – soon fell away. This process of political fragmentation has indeed looked as if it might go further. The politics of newly-independent Argentina has been dominated by tension between Buenos Aires and the various provinces, which have aimed at greater independence for themselves. This tension has been fuelled by the free-spirited gauchos, who have backed all resistance to attempts to impose control over the country at large. Finally, the anarchy in the country was brought to an end by the ruthless dictatorship of Juan Manual Rosas (ruled 1829-52). The dictator Juan Manuel Rosas imposed a brutal regime on the Buenos Aires region of Argentina, and established a measure of rule throughout the countryside. Eventually, however, one of the provincial leaders defeated Rosas (1852). The following year a constitution was promulgated, establishing Argentina as a federal republic. The following decades have been marked by Indian wars in which the Pampas have been taken away from the indigenous inhabitants and given over to large-scale cattle ranching on huge estates. Since 1860 British investment has come into Argentina on a large scale, financing the construction of railways, ports and the meat export industry. Paraguay is initially ruled by dictators who keep the country stable at the cost of keeping it isolated from the outside world; they also build up a powerful military machine, to defend their vulnerable countries interests. When the dictatorship passes to the inexperienced but ambitious Francisco Lopez, the country becomes embroiled in a war with its giant neighbours, Brazil and Argentina, together with Uruguay (1865-70). Paraguay is utterly ruined in the war, a third of its population dead. Uruguay has experienced little but civil war between liberal commercial interests and conservative landowners. The development of steamships and refrigeration technology has opened up European markets to the cattle ranchers of the Pampas. This is a period of great prosperity for them, and for Argentina as a whole. European – above all British – investment pours into the country, the most obvious manifestation of this being the thousands of miles of railways laid down. Another manifestation is massive immigration, as over two million Italians, Spaniards and other Europeans (including a Welsh colony) settle in the country to participate in its new prosperity. Argentina is governed by civilian politicians drawn from a narrow political elite, but the introduction of universal suffrage in 1912 has paved the way for greater democracy. Paraguay slowly reconstructs itself after the devastating war of 1865-70. It is dominated by a factional struggle between two groups of politicians, liberals and conservatives. The conservatives are in power until 1904, when the liberals take over. Thanks to the enlightened rule of Jose Battle, Uruguay turns towards democracy and an ongoing commitment to social equality. This lays the foundations for decades of political stability and economic and social progress. After years of economic expansion, Argentina’s economy was hit by the global downturn of 1929. Disillusionment with the politicians led to a military coup in 1930. Although the military leaders sponsor civilian politicians, they remain the real arbiters of power. In 1946 Colonel Juan Peron is elected president, aided by the popular support given to his charismatic wife, Eva. Peron nationalises the railways and other major industries, and seeks to make Argentina economically self-sufficient. His wife, Eva, champions the poor, and wins widespread devotion from the working classes. Re-elected in 1951 with a landslide victory, Peron’s power does not long outlive the death of his wife. Big business and the army turn against him, and he is overthrown in 1955. A series of military governments follow. Paraguay remains backward and inward looking under its dictators. It wins a bitter war with Bolivia over a large, sparsely-populated territory called the Gran Chaco (1933-5). Uruguay, meanwhile, has been a beacon of political stability, economic progress and social justice until the 1950’s. It is called the “Switzerland of the Americas”. From the mid-1950’s onwards, however, it experiences a period of economic stagnation.